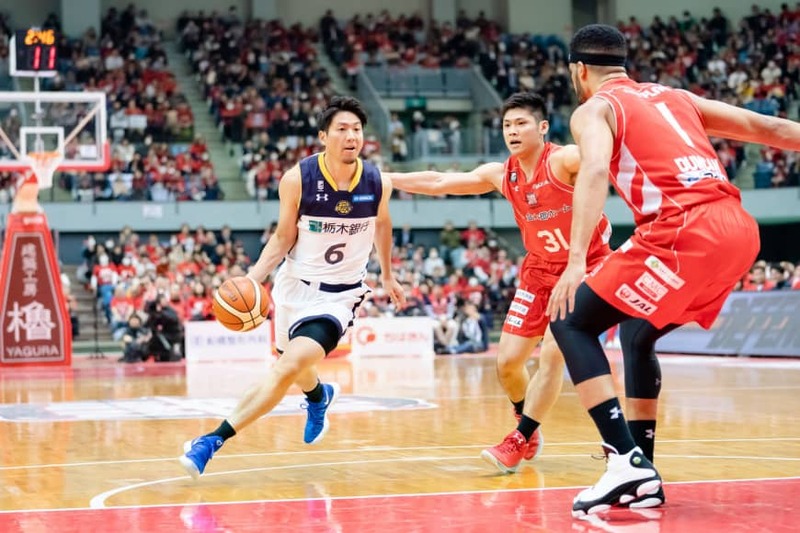 After their thrilling Emperor’s Cup final that went to overtime on Sunday afternoon at Saitama Super Arena, the title-chasing Chiba Jets Funabashi and Tochigi Brex staged a rematch on Wednesday night. Indeed, there was a buzz far greater than a typical regular-season game because of that enticing reason. And the proximity of the rematch. When Yuki Togashi buried a nothing-but-net 3-pointer for the game-winning points in the closing seconds in overtime of the final, the Jets secured an impressive third straight All-Japan Basketball Championship crown. They authored a 71-69 victory. And they’ve become a January dynasty. And so there was very little time for Chiba, the B. League’s 2017-18 championship runner-up squad, to savor its Sunday achievement, or for Tochigi to lament that it came up short. The schedule makers look like geniuses for having this compelling drama on the docket just before this weekend’s All-Star break. Chiba defeated Tochigi 80-71, with 30 fourth-quarter points securing the Wednesday victory. The Jets improved their league-best record to 27-5; the Brex slipped to 25-7. Togashi paced Chiba with 23 points and dished out six assists. Gavin Edwards and Michael Parker, both of whom made big plays repeatedly in the Jets’ three Emperor’s Cup wins last week from the quarterfinal round to the final, contributed 16 and 15 points, respectively. For Tochigi, Yusuke Endo finished with 13 points and Jeff Gibbs had 12 points, 12 rebounds and five assists. In his Brex debut, 2017-18 B. 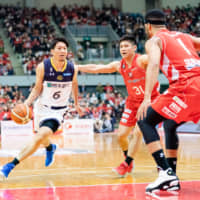 League MVP Makoto Hiejima came off the bench and contributed six points on 2-for-7 shooting with four assists in 15-plus minutes at Chiba Port Arena. For Hiejima, the game produced a less-than-satisfactory feeling. Brex coach Ryuzo Anzai quickly put the loss behind him, saying the focus is on next Wednesday’s opponent. “I want to rebuild from here and prepare for next week’s Sunrockers Shibuya match,” Anzai said. Tochigi star Ryan Rossiter said his team’s performance was “bad.” He said establishing a more unified team with Hiejima on board is the focus now. Also Wednesday, it was Tokyo 81, Akita 72; Shibuya 85, Hokkaido 80; Kawasaki 87, Toyama 67; San-en 97, Yokohama 91 (OT); Niigata 86, Mikawa 63; Nagoya 74, Shiga 68; Kyoto 67, Osaka 58; and Ryukyu 74, Fukuoka 64. The third annual B. League All-Star Game is schedule to tip off at 7:10 p.m. on Saturday in Toyama. The starting B. White squad as voted by fans is as follows: Brex guards Yuta Tabuse and Hironori Watanabe and Tochigi forwards Rossiter and Jeff Gibbs along with Alvark Tokyo forward Yudai Baba. On Thursday, it was announced that Rossiter will miss the game due to influenza. The B. Black starting lineup includes Togashi and Ryusei Shinoyama of the Kawasaki Brave Thunders in the backcourt along with forwards Yuto Otsuka of the Toyama Grouses and Kosuke Kanamaru of the SeaHorses and Kawasaki center Nick Fazekas. Alverk bench boss Luka Pavicevic is the B. Black coach and Chiba’s Atsushi Ono is set to guide B. White. After five stellar seasons with the SeaHorses, Hiejima went to the NBL’s Brisbane Bullets in the offseason. Lack of playing time (three brief appearances in 19 games) in Australia factored greatly in his decision to return to Japan last week. Bullets assistant coach Mick Downer said playing time is paramount for Hiejima at this stage of his career. The Ryukyku Golden Kings on Wednesday announced the signing of 203-cm American power forward Kevin Jones, a veteran of the NBA Development League and overseas pro circuits, including France, Serbia, Croatia and Spain. The 29-year-old Jones also suited up for the Cleveland Cavaliers in the 2012-13 campaign, appearing in 32 games off the bench. As a college senior, he averaged 19.9 points and 10.9 rebounds for the University of West Virginia.